If deleveraging were to be obvious, then why do banks resist? This is not a post that intends to empathize with banks. However, it responds to recent comments after the publication of the Basel III leverage ratio rules. Most of us agree that banks should be less levered, but this is not happening at a fast pace. This begs the question: if deleveraging were to be obvious, then why do banks resist? Bank capital is expensive because of debt subsidies and agency costs, see Modigliani and Miller (1958); Modigliani and Miller (1963); Miller (1995). However, debt subsidies and agency costs do not exclusively affect banks, e.g. corporate firms and home owners deduct interest too. Therefore, an answer based on M&M may be incomplete. We should find a characteristic that uniquely applies to banks, and that is leverage. It’s the very high leverage that makes banks special, see the picture below. 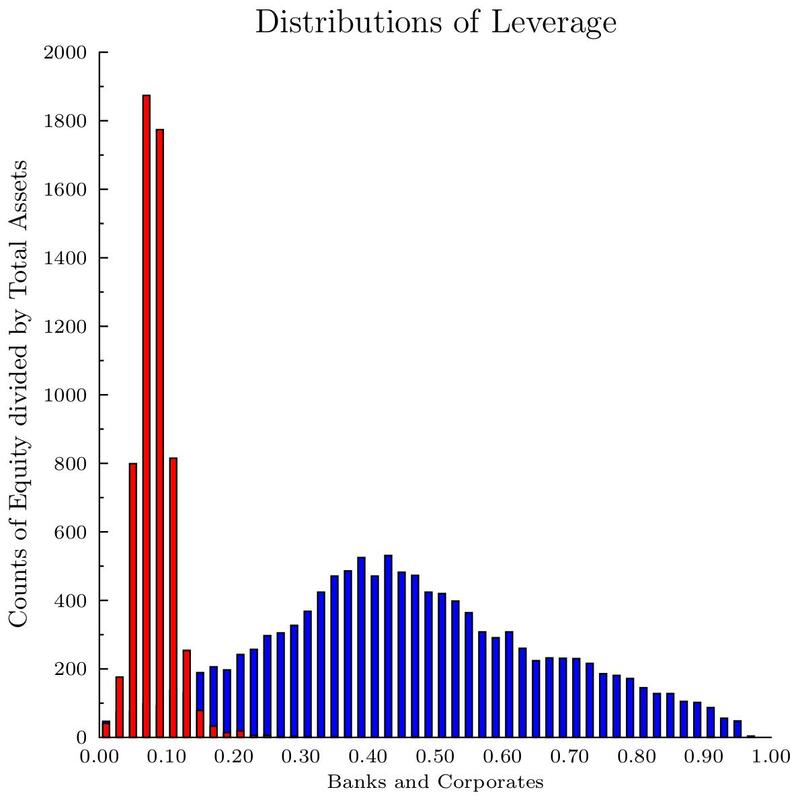 The blue area shows leverage of U.S. corporates, the red area shows the leverage of U.S. banks. Extreme leverage ratios create problems with own dynamics, as I will explain more elaborately below. For the impatient reader: an extreme leverage ratio basically renders a share into a valuable option. Owners are reluctant to voluntarily lower the value of this option, only force will work. The option-characteristic of the share of a highly levered firm (bank) is valuable to the holder. He will not like the value of the option to diminish, for example, by lowering leverage. Therefore, one shan’t expect individual banks to de-lever voluntarily. The way to de-lever is by force: a central authority should instruct banks to do so. The option-characteristic of a share of a highly levered firm originates from the ability of the owner-shareholder to walk away from his firm unpunished. By doing so, he will hurt the debt holders of the firm. A free-rider problem thus ensues: the more debt, the higher the value of the option to walk away, the higher the pain the debt-holders will feel when the owner decides to walk. Now, in this setting of high leverage, why would the owner lower leverage voluntarily? Less debt will please debt holders for sure, but this is at the cost of the owner, who gives away the value of the option to walk away from his firm. Therefore, I think it is naïve to expect banks to voluntarily de-lever. The equity holder will always lose the time value of money, because he redeems debt now instead of later. This explains the upper bound in Equation 3 (Smith, 1976). However, he also forfeits the option value of equity, which is most valuable when leverage levels are high. According to Admati et al. (2013), the equity holder loses most benefits of deleveraging to the debt holders. That explains why deleveraging is undesirable from the perspective of the equity holder. where dE/dK is the partial derivative of the value of equity with respect to debt. Equations 2 and 4 show that the cost of deleveraging increases with leverage (K/A). The cost of deleveraging approaches a lower bound of 1-e-rt if the bank has close to zero debt. At that point, the relevant costs reflect the opportunity costs of expediting the debt redemption. 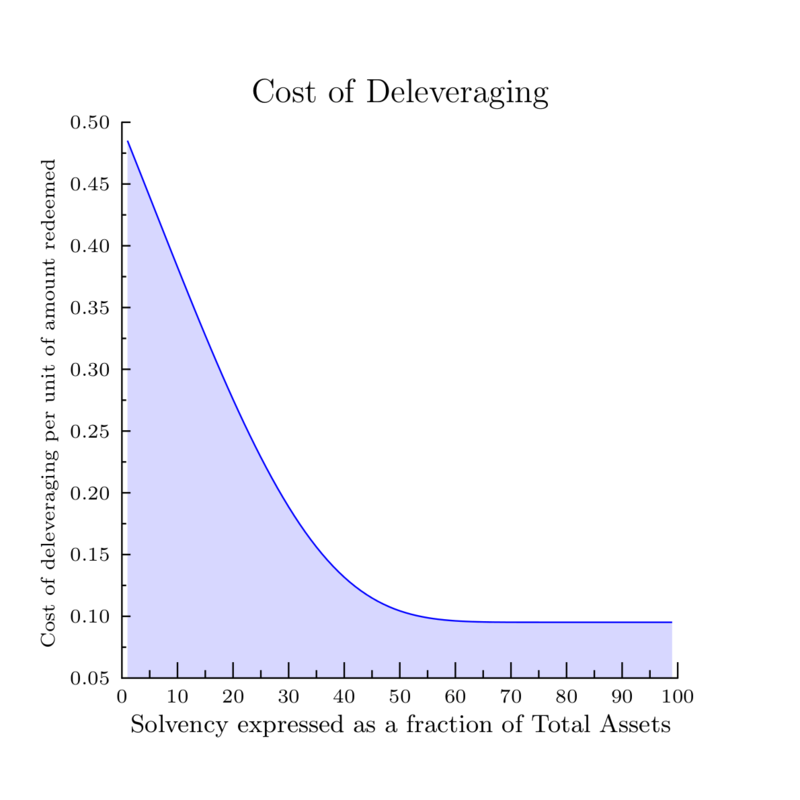 From Equation 4 follows that the relation between the cost of deleveraging and solvency is convex: high at low levels of solvency, declining with solvency, and approaching a lower bound when solvency is at its maximum. The picture below shows the cost of deleveraging. The horizontal axis represents solvency, the inverse of leverage. At the far right, there is no debt, at the far left there is no equity. I assume the following parameter values: time to maturity 2.5 year assuming on an average maturity of a 5 year Tier 2 hybrid capital security. The risk-free rate: r=4.0%, annual standard deviation =20.0%. The picture shows that the cost of deleveraging is particularly high when solvency (leverage) is low (high). This may explain banks’ resistance against deleveraging. Firms with normal solvency levels, say form 50% and higher, mainly lose the time value of the redeemed money. Admati, A.R., P.M. DeMarzo, M.F. Hellwig, and P.C. Pfleiderer (2013). The Leverage Ratchet Effect. SSRN eLibrary(ID 1669704), 172. Merton, R.C. (1974). On the Pricing of Corporate Debt: The Risk Structure of Interest Rates. The Journal of Finance29(2), 449470. Miller, M.H. (1995). Do the M&M propositions apply to banks? Journal of Banking & Finance19(34), 483489. Modigliani, F. and M.H. Miller (1958). The Cost of Capital, Corporation Finance, and the Theory of Investment. American Economic Review48(3), 261297. Modigliani, F. and M.H. Miller (1963). Corporate Income Taxes and the Cost of Capital: A Correction. American Economic Review53(3), 433443. Smith, C.W. (1976). Option pricing: A review. Journal of Financial Economics3(1-2), 3 51.